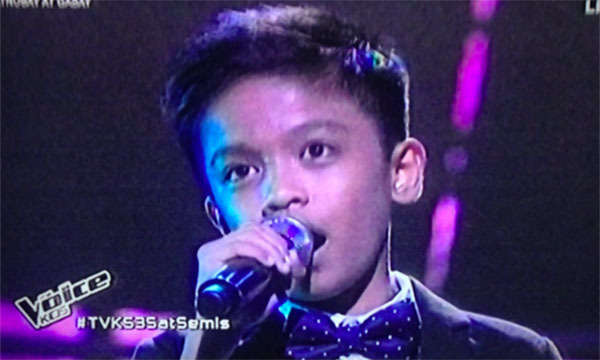 Alvin Dahan from Team Sharon performs his version of ‘Pangarap Ko ang Ibigin Ka’ on The Voice Kids Philippines Season 3 Live Semifinals on Saturday, August 20, 2016. “You all made us happy not only your father as well as the City of Davao. Wonderful performance,” said coach Lea. “I’m very proud of you. Even if there is some nervousness in your delivery. It’s ok because you still made it,” said coach Sharon. What can you say about Alvin’s performance? Share your thoughts and views on the comment section below. The Top 9 contestants of The Voice Kids Philippines Season 3 will perform live at the Resorts Word for your votes. Results will be revealed after their performances.